It’s never been easier to learn how to grow and enjoy a cutting garden or how-to start a small urban cut-flower farm! Click for more details! Change spring in your garden with Lisa’s valuable tips on growing the cool-season hardy annuals of spring– no matter where you live! Click for more info! Claim your FREE Vegetables Love Flowers online book study! Author Lisa Ziegler digs deeper into each chapter sharing her insights and experiences. Try our reliable, easy-to-grow flower and vegetable seeds. Our soil blockers and other seed-starting products make it super simple. Do you live in the Newport News area? Join our cut flower CSA or enjoy our weekly bouquet drop-off service. Our Virginia farm produces thousands of cut flowers each week in season. 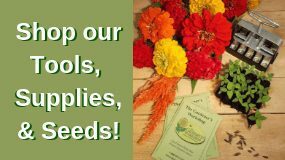 We sell them locally, and offer products and presentations to help others grow from seed. Our online store is stocked with the same seeds we plant and the tools we use – our personal favorites, tested and proven right here on the farm. We have used the soil blocking method of seed starting since 1998. 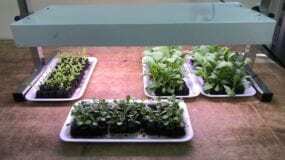 We find it easy, space savvy and produces very healthy transplants. Sign up to receive Lisa’s webinar What it Takes to be a Flower Farmer! FREE. Lisa shares from 21 years of experiences and insights on becoming a successful flower farmer. 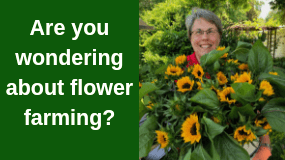 Learn if flower farming is for you. Lisa’s Story – How it started! Lisa has become a leader in the cut-flower growing industry, author, accomplished speaker and the owner of The Gardener’s Workshop.